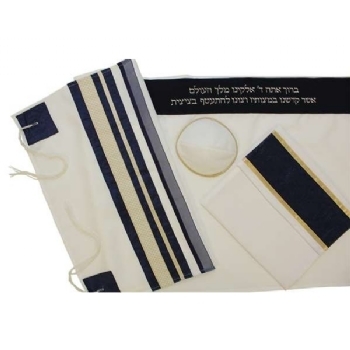 Unique blend of Navy and Gold colors in this hand made tallit. Neckband is hand embroidred with prayer to dawn the tallit. The corners match the panels on the tallit as does the matching bag. 3 Piece set. ← Light Blue Prayer Shawl.